bok choy sometimes called, Chinese cabbage, is in the mighty cruciferous family with all their anti-oxindants and fiber. 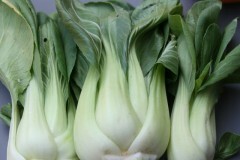 Bok choy is choy full of beta-carotene, vitamins D, C, A & K, potassium and calcium. Shall I go on...this power veggie helps build stronger bones, regulate heart function and maintain blood pressure, fight certain cancers +it'slow-fat, low-carb and low-calorie vegetable. For some, homemade guacamole is made with one scoop of guacamole, one quart of serving bowl, and a four-hand grip of tortilla chips. Step 1: dip and devour. Tastes like chicken right? Themost common food search term is “chicken recipe.” And I thought it was minted pea puree. So, I owe you a chicken meal post. Five mentions of chicken in first paragraph and my SEO will be through the roof. chicken.